John Hurt in ‘Krapp’s Last Tape’. “Krapp’s Last Tape” by Samuel Beckett typically covers ten printed pages in play form. It runs anywhere from 40 minutes to an hour. But enfolded within those truncated boundaries is contained the enigmatic epic of a man’s life. It is arguably Beckett’s most autobiographical work, and considered by some to be his most accessible. Beckett, who is always very meticulous in his stage directions, described Krapp as “Very near-sighted (but unspectacled).” So what is visible to him is only that which is literally under his nose. Krapp is not a far-sighted being. Perhaps to compensate for this impairment every year, for many, many years Krapp has recorded tapes on his birthday, messages to the person he will be one day. Now, in the closing act of his life, we find the aged Krapp methodically working through those tapes. Like a reveler in a carnival’s fun house peering at his reflections lining up ad nauseam. Now in his late sixties he listens to the tape from his 39-year-old self, listening to him as if to a stranger. Even the speaker’s language is alien to him as Krapp is repeatedly forced to turn to a large, old dictionary to discern the speaker’s meaning. The details given by the voice are those of Beckett’s life. 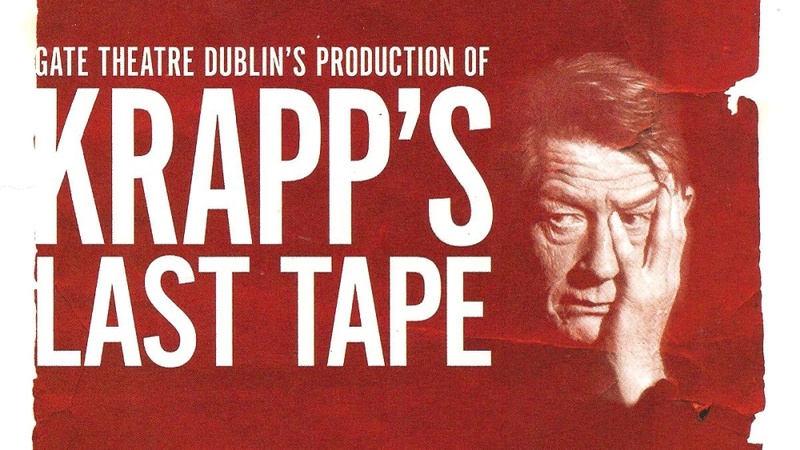 On the tape, mention is made of Krapp’s father with reference to his dying twelve years earlier, making Krapp the same age as Beckett, 27, when his father died. There are many others. Like a lingering lake mist, poetry is always wafting just beneath Beckett’s deceptively simple wording. That is especially true of “Krapp’s Last Tape“. “The new light above my table is a great improvement. With all this darkness around me I feel less alone.” But that is a lie. Even among this reunion of his many selves he’s alone. 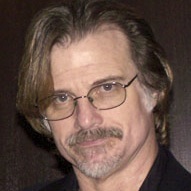 In the theater, to “inhabit” a role it demands an actor possess some blend of talent, training and technique. This is true of Beckett’s characters as well – up to a point. Talent, training and technique have their value, but what is essential for playing Beckett is the distinctive quality of history. Most actors have no history, being as they generally have sprung from Zeus’s forehead; or perhaps from Strasberg’s studio, the Yale drama school, or the world of glossy fashion ads. But in some faces every step, every stumble of a long journey is visible; every tear, every laugh carves the visage with winding wrinkles. They are generally faces of broken noses, but not spirit. In playing Beckett this is what matters most. That’s why the most lauded Di-Di and Go-Go have not been “actors” but vaudevillians and clowns. That is why the production of “Endgame” that is branded on my soul was not performed in a theater but an AIDS hospice. John Hurt is an actor burdened by history. A lonely child from a strict religious upbringing, sexually abused, a one time pornographer and borderline drunk, thrice divorced, the great love of his life tragically taken; you see all this in his face. And his eyes. History. In the role of Krapp, John Hurt is…well take your pick: overwhelming, sublime, astonishing. He doesn’t play the role, he lives it. Directed by Michael Colgan, of Gate Theatre fame, this is one of those rare opportunities to see a great actor in a great play and to be pervaded by great, great theatre.